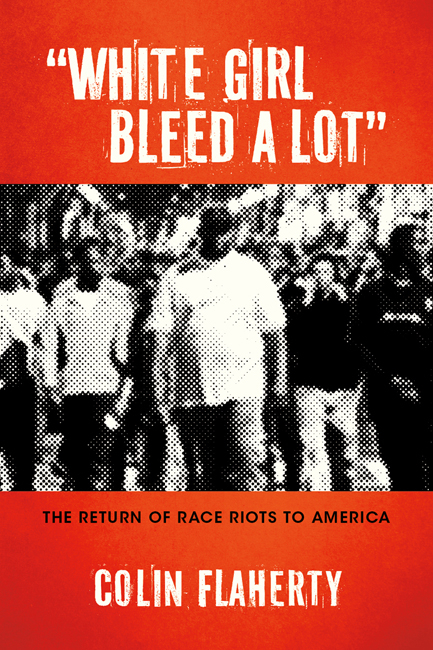 White Girl Bleed a Lot: The Return of Race Riots to America. When Colin Flaherty set out to write a book about an explosion of racial violence in this country over the last two years, he was often met with two reactions: Denial. Or explanations. Local media and public officials are often silent. Crime is color blind, says a Milwaukee police chief. Race is not important and if you notice, you are a racist, a Chicago newspaper editor says. A police chief said he knew what was responsible for a tsumami of violence: Sarah Palin. And don’t call them flash mobs. “That is just another way to deny and marginalize what is happening,” he writes. The cases are too frequent too ignore. And it is not just Philadelphia and Chicago and New York. That’s what makes it strange: it is also happening in some very unlikely places. The list goes on: Indianapolis. Denver. Rochester. Boston. Miami. Houston. Atlantic City. Rehoboth Beach. Dover, Delaware. Charlotte. San Francisco. And on and on and on. Flaherty makes a persuasive case that without YouTube and talk radio and citizen journalists with cameras, it would have been impossible to make the case. Baltimore is a good example. In April of 2011, more than 100 black people raged through the Inner Harbor area, with vandalism and violence in their wake, including one stabbing. News accounts from the Baltimore Sun do not specify the race of the people doing the rioting. But curiously, the paper quoted the head of the local NACCP saying just because the rioters were black, that doesn’t mean the riot was racial. That is how strange and powerful this is: People are denying charges before the charges are made. The book features chapter on racial violence against gays, women and Asians that is especially troubling. This is a challenging book. An interesting and powerful and ultimately persuasive book by a great American writer not afraid to look at one of the most thought about but unspoken features of American life. He is also the author of Redwood to Deadwood: A 53-year old dude hitchhikes around America. Again. (http://www.RedwoodtToDeadwoodBook.com) He is a former ghost writer for the first black chairman of the U.S. Commission on Civil Rights. His story on a black man unjustly convicted of assaulting his white girlfriend was the subject of a stories in the national media, including a one hour special on Court TV. This is one of Mr Flaherty's documents about so many race riots involving violence, vandalism, and mob beatings of non-blacks. "This is a challenging book. An interesting and powerful book by a great American writer not afraid to look at one of the most thought about but unspoken features of American life." 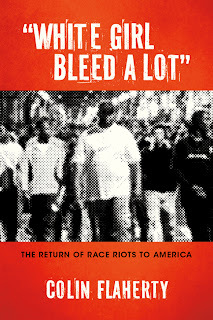 White Girl Bleed a Lot: The Return of Race Riots to America http://whitegirlbleedalot.com/ And how the media ignore it? 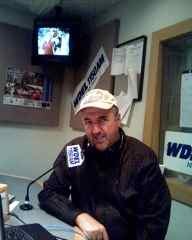 Flaherty also exposed how media, local police, and politicians refused to talk about the racial aspect of the incidents. The ebook has many clickable links for video and photo which makes it really interesting.